Though one won’t find crime tape around an archaeological site, these two disciplines have many similarities (“Crime-scene-tape”). You won’t find your favorite television detective like Adrian Monk or CSI investigators scouring an ancient Egyptian site. Similarly, archaeologists with their khakis and trowels don’t usually investigate crime-scenes. These two seemingly different fields are surprisingly similar as I learned from an archaeologist’s lecture on a crime-scene photograph taken in 1940s New Jersey. Archaeologists use objects from the past and people’s interactions with those objects to learn about the past. 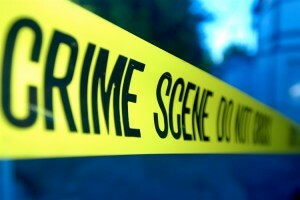 Crime-scene analysis also uses people’s belongings and how they interacted with them to solve a crime. 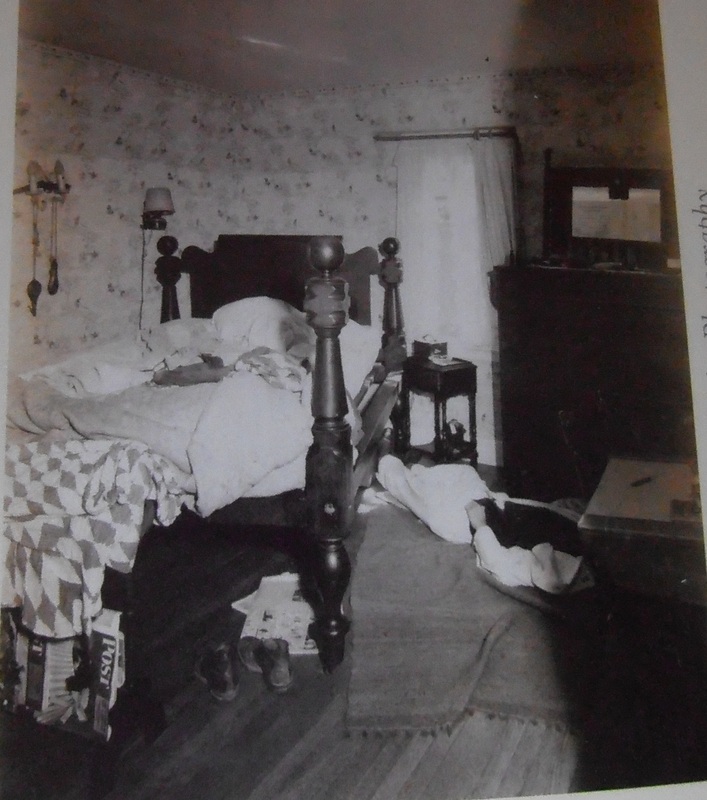 Below is a photograph of a simple bedroom with a dead body lying on the floor. From the everyday objects found in the room, one can use archaeology to learn about the crime. This photograph was taken anonymously and has no further background information (Anonymous). The deceased’s face cannot be seen; therefore, artifacts in the room can determine who the victim is. Toys hang from a light fixture on the left wall. The artifacts’ provenience (it’s 3D location) shows they aren’t used anymore since they look decorative and are in an inaccessible location. A pipe on his dresser with wear at the mouth-end is in association with an empty ash-tray. If he smoked frequently, the ash-tray would be dirty. These three artifacts show that the victim was likely between 16-20 years old; he is growing out of childhood (toys on the wall) yet doesn’t fully embrace adulthood (an empty ash tray along with a pipe). Archaeologists can use relative dating (using another item’s age to date something else) to determine when this crime occurred. Two consecutively published Post magazines date the crime-scene to mid-March 1946. On his bed rests a shirt and pants with the belt still in them next to a hanger. The victim is nicely dressed showing that he likely just undressed after returning home from work or school and is preparing for a formal event or job. Nothing is in his hand, the rug shows no sign of struggle, and a letter opener rests on his desk. If the victim fought back, he would likely have grabbed the letter opener as a weapon. The only blood present pools out from his head. He was likely leaning over his bed ready to hang up his clothes when from behind, the murderer struck with something blunt. Be it 6 hours or 6,000 years ago, archaeologists and crime-scene investigators analyze objects from the past and how people interacted with them to paint a picture of what actually happened. The next time you watch your favorite detective show look for the things used to solve the crime and compare them to artifacts archaeologists study. You’ll often find little difference. Anonymous. 1940s. Photograph. The Frances Lehman Loeb Art Center, Poughkeepsie, NY.The Artful Dodger Goes Late Night. Poughkeepsie: Vassar College, 2013. Print. Beisaw, April M. “The Scene of the Crime.” Vassar College, Poughkeepsie. 31 October 2013. Lecture. Crime-scene-tape. Digital image. 5 REASONS WHY A CRIMINAL JUSTICE ONLINE DEGREE IS RIGHT FOR YOU. Florida National University, n.d. Web. 2 Nov. 2013. This entry was posted in Fall 2013 and tagged Art, Forensic Archaeology by stkachelein. Bookmark the permalink.